March has always been a good month for UConn, in particular for its basketball program. This is when players step up and hit the big-time shots (think Kemba circa 2011). While the current UConn team isn’t seeing any action this March, the alumni have been showing out and proving to the fans they’ve still got it in the NBA. Let’s highlight some of the top alumni players of March and see what their improved play means for the playoff picture. Cardiac Kemba was in full effect over the past month and boy has it brought back some great memories. In the last 30 days, Walker has averaged 25.1 points, 4.5 rebounds and 6.4 assists, all above his season averages. While the Hornets have gone 6-8 over those games, they are currently on a three-game winning streak, which is in no small part due to Walker. The three-time All-Star exploded for 18 of his 36 points in a fourth-quarter comeback against the Celtics and chipped in an impressive 15/8/13 stat line in another huge victory against the No. 2 seed Raptors during the win streak. While he hasn’t been the most efficient player on the court, he’s been doing what has been asked of him and more. With nine games left and the Hornets currently sitting at No. 10 in the Western Conference, Walker is going to need to kick it up another notch and close the season like he closed the Pitt game in 2010 if the team has any hope of making it to the playoffs. While Drummond and the Pistons are in a better position than the Hornets, they are anything but a lock for postseason action. The big man has double doubles in 14 out of the 15 games he has played in the last month, four of which he totaled at least 20 rebounds. Drummond did all this while leading the Pistons to a 9-6 record, including a five-game winning streak to open the month. Averaging 16.4 points, 16.2 rebounds and a combined 2.7 steals and blocks over the last 30 days, Drummond is doing everything in his power to keep the team’s playoff hopes alive. He is even hitting free throws at a 73 percent clip! He may not have had much collegiate success in March, but Drummond is looking to right the ship in his professional career while averaging a career-high in points (17.3) and once again leading the league in rebounds per game (15.4). The Spurs have turned the season around when it mattered the most and that is in no small part due to Gay’s production. In the last month, the Spurs have gone 10-3 including a nine-game winning streak in which they beat teams like the Nuggets, Bucks and Warriors. During this period, Rudy Gay looked like he was back in his prime from when he was with the Grizzlies. He put up averages of 12.2 points, 6.9 rebounds and 2.8 assists, all around his season averages, and did so on 48 percent shooting from the field. Gay’s contributions to the team are vital, as he can score when necessary, seen by his 17-point game against the Warriors, but he can also step back into more of a facilitator role for All-Stars like Aldridge or DeRozan. His stats may not be as gaudy as other players’, but his impact is just as great, and the Spurs will need him to keep contributing if they hope to remain or improve upon their current No. 8 seed ranking in the West. Remember that big win I talked about when the Hornets beat the Raptors? That win came courtesy of Jeremy Lamb. A half-court heave to beat the buzzer was all it took to turn a sub-par game from him into one of his most memorable ones. There’s just something about the month of March that makes these alumni some of the most dangerous in the league in crunch time. That game aside, Lamb continues to be a model of consistency and a solid second option behind Walker, putting up 15.2 points and 5.7 rebounds per game, both of which are career-bests. He has also started to pick up his efforts on the defensive end, rejecting at least one shot in 10 of the team’s 14 games played over the last month. 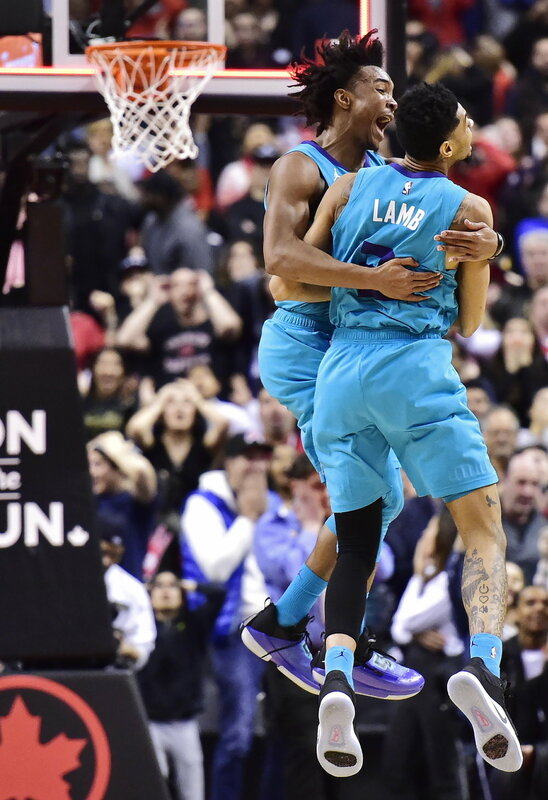 Lamb will need to continue his streak of good shooting while maintaining his efforts on defense if the Hornets have any hope of making the playoffs. While the Nets have certainly had a season to remember, it hasn’t been the same story for Napier. Both Spencer Dinwiddie and Caris Levert returned from injury, pushing Napier even further down the depth chart to the point where his playing time, and therefore impact, have been minimal. In fact, Napier hasn’t played a game since March 11 due to a mix of injuries and the coaches deciding not to play him. There is a chance we see a little more of Napier in the playoffs, as the Nets currently sit at No. 6 in the Eastern Conference, but it looks like he’ll be spending the rest of the regular season on the bench while the Nets continue to roll. Napier has shown he can play well when given the time, but he may want to look to join another team with a little less depth at the guard position for next season.